New & Used Industrial Shelving | Ace Industrial Equipment, Inc. Ace can cover all of your industrial shelving needs, whether you need warehouse storage or storeroom shelving. 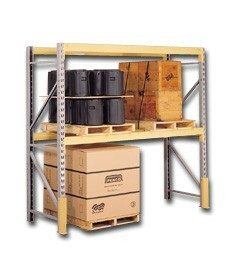 We will work with you to quickly identify your specific needs and get you the correct industrial shelving and racking. We will make sure that the industrial shelves you purchase will meet all of your weight requirements and safety specifications, whether you are looking for modular storage, plastic storage, or heavy-duty industrial storage in metal or steel. As experienced warehouse rack liquidators, we ensure you receive closeout prices by constantly taking in huge quantities of all types of industrial shelving units, so you can expect to get the absolute lowest prices available.